This Tuesday, the people of Chicago will go to the polls for a special runoff election to decide who will lead their city for the next four years. When they do, no matter which of the two mayoral candidates wins, the result will be that the next mayor of the country’s third-largest city will be a black woman, possibly a queer black woman: either Cook County Board Chair Toni Preckwinkle, or former federal prosecutor Lori Lightfoot. This fact is unprecedented and noteworthy—although, in the age of Black Lives Matter and the Movement for Black Lives it is also not enough (about which I’ll say more shortly). Politics in Chicago have long flowed from two fundamental, intertwined truths: White, male-led machine politicians have worked to keep outsiders at bay, while trying to keep black voters and black politicians in check. The first black mayor, Harold Washington, suffered the full force of these truths. Washington endured racist attacks during his historic 1983 campaign, followed by a ferocious backlash after he was elected. One opposition candidate charged that City Hall was being run by “pimps and panderers,” while a bloc of 29 white aldermen moved to block every appointment Washington sought to make, in effect sabotaging city government for years. That was how determined they were to not have a black man in charge. Thirty-six years later, a lot has changed in the city that was once deemed one of the most segregated in the United States. In the wake of a historic first round of elections in late February, not only do the mayoral contenders look and sound different from their predecessors, so does the incoming City Council. During this election season, many young, independent, queer folk of color have made bids for office, or taken an active lead in key campaigns. And they are not solo careerists; they are tied to a sprawling network of community organizers. Their low-budget, high-energy grassroots efforts garnered wins in February for young progressive candidates like Maria Hadden, 38, who has ties to the Black Youth Project 100. Rossana Rodriguez, a young Puerto Rican socialist and activist from the Northwest Side is in the April 2 run-off for the 33rd ward. Other left-leaning independents contending for City Council seats in the upcoming run-offs include 20th ward candidate Jeanette Taylor, a working-class African-American activist who was apart of a 34-day hunger strike in 2015 to help keep a neighborhood school (Dyett High School) from closing, and Byron Sigcho-Lopez, who describes himself as running against “corporate interests” and “machine politicians” in the 25th ward. Along with these new faces has come a repudiation of the city’s corrupt political past. For as long as most Chicagoans can remember, there have been a lot of “yes men and women” in the City Council rubber-stamping everything the mayor’s office sent their way. Those days may be gone. In order to be a viable contender in this electoral season, especially with local corruption scandals in the headlines, Chicago candidates had to adamantly reject business as usual. “We should view this election cycle as the beginning of a seismic shift against the neoliberal project that has resulted in privatization, militarized policing and destruction of many of our community institutions and resources,” says Aislinn Pulley, lead organizer of Black Lives Matter Chicago and a rising presence in the city. For Mariame Kaba, longtime organizer and mentor to many young Chicago organizers, all this signals a “sea change” in city politics. But this shift didn’t arise suddenly or spontaneously. Much was set in motion by a slightly older generation of organizers and teachers, people like Kaba who held workshops, teach-ins and leadership training sessions and mentored many of the activists who are now at the forefront of Chicago politics. They, in turn, acquired skills and savvy through a series of local campaigns, all the while building relationships with one another, Kaba says. Many in this new cohort of activists cut their political teeth on successful campaigns to oust State’s Attorney Anita Alvarez and Police Chief Garry McCarthy for their roles in the Laquan McDonald police-murder case. Another critical came with the 2015 City Council Reparations Ordinance for survivors of police torture, which was the culmination of a five-year struggle for accountability in the Jon Burge torture scandal. And it is impossible to escape the shaping influence of the Black Lives Matter Movement (now a part of the larger national coalition, the Movement for Black Lives), which not only birthed a new political ethos—one that goes beyond simplistic notions of representational race politics—but also emboldened a new grassroots force of powerful leaders, many of them women. These women include activists like former BYP100 leader Charlene Carruthers, who stood on a chair and closed down a Police Board meeting that was being chaired by mayoral contender Lori Lightfoot in 2016; Carruthers, and the dozens who stood with her, were demanding the City fire police officer Dante Servin for the 2015 murder of Rekia Boyd. And they are women like Aislinn Pulley and Page May, one of the founders of Assata’s Daughters and an activist in #NoCopAcademy, an expansive campaign in opposition to the construction of a $95 million police-training and recreation center on Chicago’s predominately black West Side. These young women are all formidable forces in Chicago politics. But they don’t stand alone. They represent a new style of leadership that works in coalition—across multiple geographic, generational, and demographic divide—and is more interested in public accountability than backroom deals or cushy city jobs. What this means is that, as exciting as the prospect is of a city led by a woman of color, many activists aren’t resting on this achievement but rather they are continuing to push. Having come of age in the era of Obama, they know all too well that black elected officials don’t equal black liberation. They are savvy enough to understand the struggle is much bigger than that. And they have been asserting pressure accordingly. Indeed, it was the organizers in the campaign to “End the Gang Database,” lead by the primarily Latinx group, Organized Communities Against Deportations, and BYP100 that pushed both mayoral finalists to take a stand against the gang database. (This database, compiled by the Chicago Police Department, racially profiles individuals without cause, with virtually no transparency and questionable criteria). The campaign has been a two yearlong struggle and has created stronger black and Latinx unity on the community level—a feat few aspiring politicians have been able to achieve since Washington. At the same time, organizations like Southsiders Organizing for Power (STOP) and Kenwood Oakland Community Organization (KOCO) have been pushing for a community-benefits agreement (CBA) with the new Obama Presidential Center to make sure that low-income, predominately black, community residents benefit from the center and are not pushed out of the neighborhood by rising rents and property values. This, too, both mayoral hopefuls have agreed in principle to support. Chance the Rapper. She says that, while some young people who have been newly activated politically are more likely to show up at a protest, than at the polls, the goal is that they do both. “We have to have a dual strategy to hold politicians accountable,” Enyia says, while declining to endorse either of her former rivals. And in this moment politicians are taking their lead from organizers—at least rhetorically—not the other way around. For her part, Preckwinkle said she sees a complementary relationship between “advocates” and progressive elected officials, each with their own role to play in the ecosystem. She was one of the founders of the Progressive Caucus in City Council during her time there. So, what’s next for Chicago? The time between the February 26 election and the April 2 run was a busy time for Chicago activists. On the morning of Sunday March 3, activists from 15 Chicago organizations, convened by the R3 coalition (R3 stands for Resist. Reimagine. Rebuild. Chicago), gathered to talk about a plan they have dubbed “Heal the City/ Free the City” to push run-off candidates to “clarify and commit” to concrete changes in their first hundred days in office, and to hold them accountable after the election. Among the core issues they want the candidates to address: the ongoing “black exodus” from the city—the fallout, many believe, of gentrification, violence, and the lack of services and resources in many of the city’s working-class black neighborhoods. At the same time, the vibrant and highly politicized arts community has buoyed activists’ energy and optimism. The Breathing Room, a gathering space curated by playwright and activist Kristiana Colon, artist-activist Damon Williams, and the Let Us Breathe Collective has become an important hub for meetings, strategy sessions and “freedom circles,” and for the “radical imagining” of what a new Chicago might look like. There are a number of takeaways from the Chicago example. One lesson is not to ignore the black left or underestimate the power and persistence of a solid black-feminist praxis. We cannot have a colorblind view of the organizing going on in Chicago. While it is definitely broad-based and multiracial, black, and Latinx leftists, progressives, and feminists have been at the epicenter of the new surge of organizing. Some members of the predominately white left are on the right side of economic-justice issues but have nonetheless failed to bring large numbers of black organizers into their ranks. 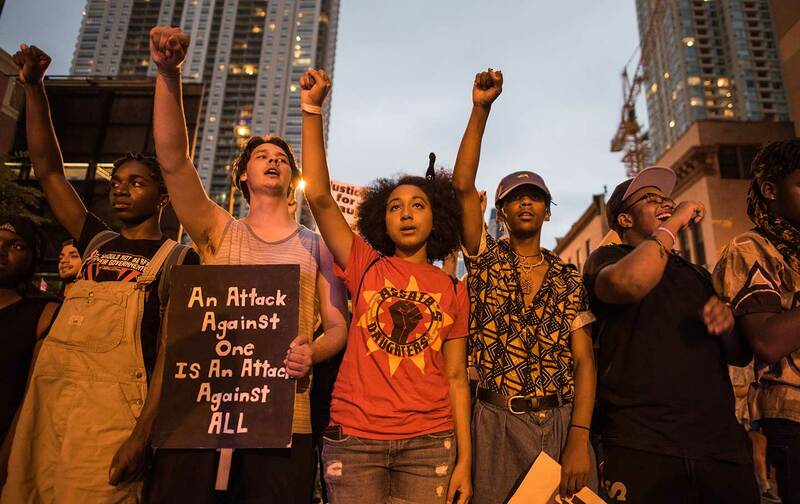 In various ways the Movement for Black Lives and its offshoot, the Majority coalition, have insisted that without black leadership and a strong racial-justice analysis, the efforts of a new New left will falter. The pattern of activism in Chicago underscores that very point. Barbara RansbyBarbara Ransby is an historian, writer, and longtime political activist. She is a Distinguished Professor of African American Studies, Gender and Women’s Studies, and History at the University of Illinois at Chicago (UIC), where she directs the campus-wide Social Justice Initiative. Professor Ransby has published dozens of articles and essays in popular and scholarly venues. She is most notably the author of an award-winning biography of civil rights activist Ella Baker, entitled Ella Baker and the Black Freedom Movement: A Radical Democratic Vision (University of North Carolina, 2003). Her most recent book is Making All Black Lives Matter: Reimagining Freedom in the Twenty-First Century. You can follow Professor Ransby @BarbaraRansby.